Enjoy this delicious Acorn Squash & Lentil Egg Bake – a nutrient packed, high protein, high fiber budget friendly recipe that costs just $1.71 per serving. This months recipe challenge was to get working on creating delicious, Budget-Friendly Eats! How low can you go? Can you make a meal for less than $3 per serving? Whatever your budget, show us your healthy entree recipe to help keep food spending in check this year. As we focus on keeping spending in check for the year, it is a perfect time to highlight how much money you can save on your grocery budget when you grow your own food. Back in December, I conducted my first annual reader survey and I was so excited to see that 57% of you said that you were interested in learning more about how to start a backyard garden in order to grow your own food to feed your family.Well I listened!! It is the perfect time to announce that coming this spring I will be adding a Gardening section to my website in order to help you to teach you how to grow your own food too. 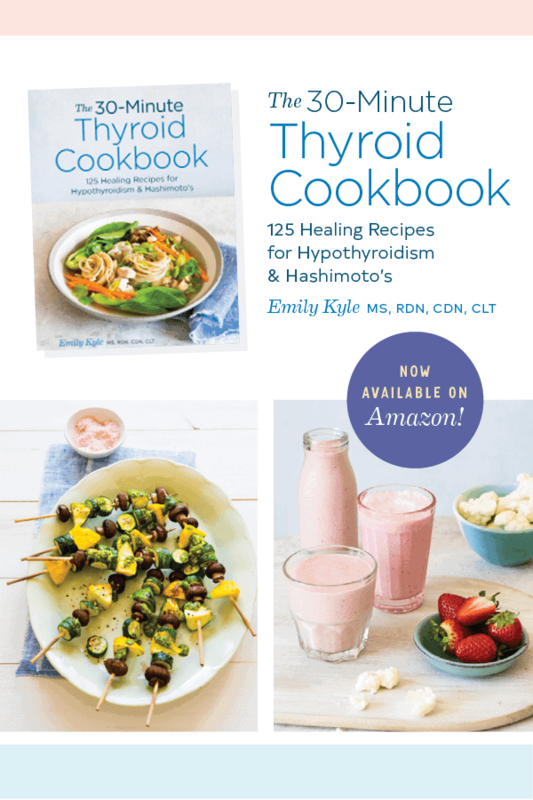 Complete with guides and videos – I am so excited to start this new journey and hope you are too!! I am also super, super excited to announce that we will be adding six new babies to the family this coming March – baby chicks as we learn to raise our own egg laying hens. Lets just break down the cost real quick. I grew A LOT of squash last year. All 40 of these beautiful acorn squash were grown from a single seed packet that cost me $3.95 for 25 seeds. I failed algebra 4 times in college BUT according to my calculations $3.95/40 = $0.09875 which equals $0.10 per squash. TEN CENTS PER SQUASH MY FRIENDS. Sure, a lot of time and energy and love was spent in growing these beauties, but to me, the effort is well worth it. And, because I am now able to preserve my own seeds from the mature fruit to start my plants over again next season, I don’t have to buy another seed packet again. As I always say, a garden is the gift that keeps on giving, and giving, and giving. Acorn squash is still budget friendly even if you don’t grow it yourself. It will be the cheapest in the Fall during harvest time, especially when purchased at a farmers market from a local farmer. But, if your simply shopping around your local grocery store, you can pick up these babies for $0.99 a pound. This recipe calls for three small acorn squash which are approximately 4-5 pounds which will run you about $3.96-$4.95. 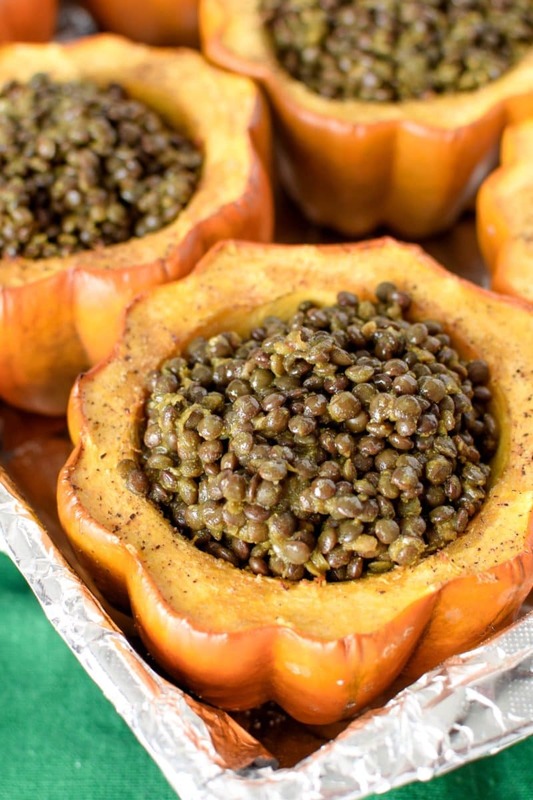 These tasty acorn squashes are stuffed with lentils, a delicious and nutritious plant-based legume which are easy on the wallet as well. A single bag of Goya Lentils from the grocery store cost approximate $1.69, depending on the variety you purchase. The can be boiled like rice and have a hearty, filling texture. Not only are lentils cheap and non-perishable but they are also a great source of nutrients as well. They are high in both protein and dietary fiber which means that they will keep you full and satisfied, a suitable vegetarian meal for any meat-loving carnivore. In addition to the protein and fiber, lentils also offer many vitamins and minerals such as b vitamins, folate, copper, phosphorus and iron. To round out this tasty meal I have topped this lentil stuffed squash with a tasty, farm fresh egg. Of course, it’s okay if you don’t have access to farm fresh eggs, you can purchase yours right from the grocery store for as little as $1.19 a dozen. If you live in a rural area like me, you can also likely get farm fresh eggs from small, road-side stands for $3-4 a dozen. These are likely to be as close to organic and free-range as you’re going to get, plus you are supporting a local farmer! I did not include the olive oil and spices in the cost breakdown for this recipe, because it is likely that you already have on hand at home. 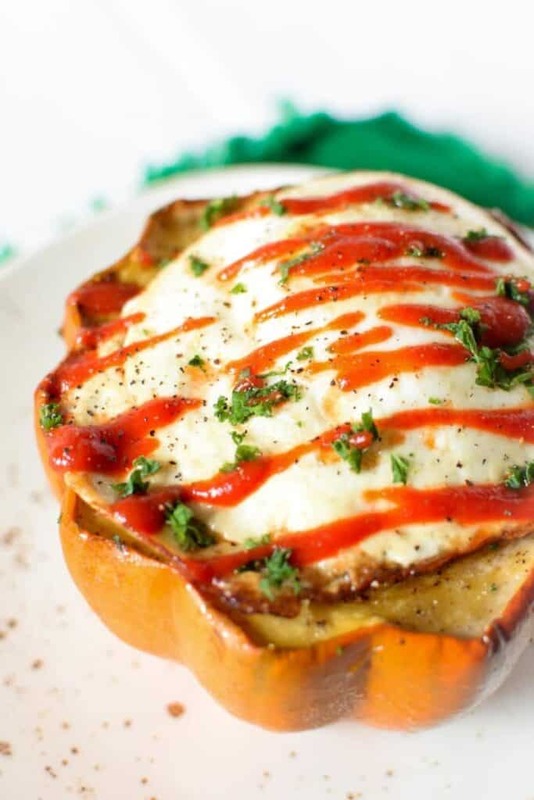 Enjoy this delicious Acorn Squash & Lentil Egg Bake - a nutrient packed, high protein, high fiber budget friendly recipe. Line a baking pan with foil and set aside. Carefully cut off each short end of the acorn squash so they will lie flat when baking. Carefully cut each squash in half width-wise and scoop out the seeds. While the squash is roasting, prepare the lentils according to package directions. Different types of lentils require different cooking times. Cook lentils should yield about 4 prepared cups. When the lentils are done cooking, strain or drain any leftover water as necessary. Add to the lentils: olive oil, minced garlic, cumin, turmeric, granulate onion and coriander. Mix well. After the acorn squash has been roasting for 40 minutes, remove from the oven and carefully add the lentil mixture to the hollowed squash. Return to the oven while preparing the eggs. For the egg topping, feel free to cook your eggs any way you choose. Fried eggs are perfect. If you want to make it easy, coat a muffin tin with cooking spray and crack 1 egg into each well. Place in the oven with the squash and cook for 15 minutes, or until firm. Remove the squash and the eggs from the oven. Top the squash with the eggs and optional garnish. I am so glad you still gave it a try, Lorie! So good, it was such a fun way to eat acorn squash! My squash weren’t quite as affordable but at least they were tasty!!! Yess! I hope you love it! I am so glad to hear this, you are most welcome! So glad you enjoyed it, thank you Natalie! I made this last night, and it was so simple and delicious. Yum! Thank you for inspiring me to cook with more lentils! So delicious! I was starting to get stuck in my old egg breakfast routine… this is definitely going to break me out of it! Love this simple dish! 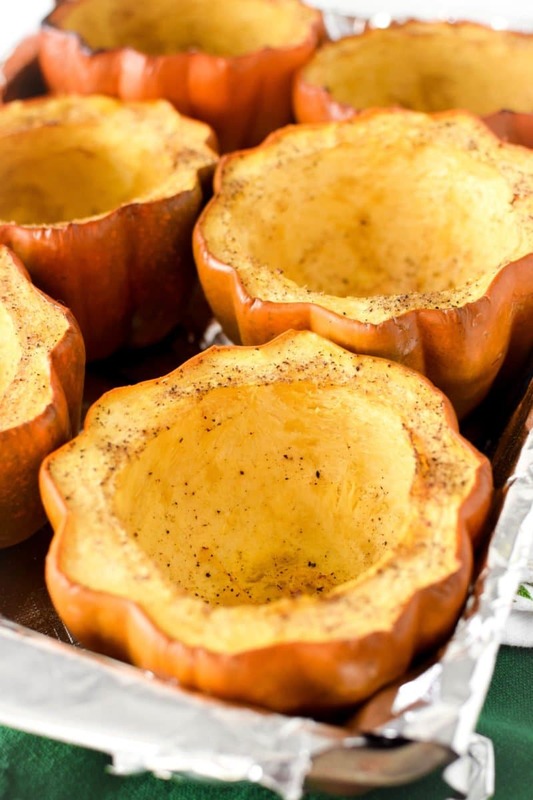 The acorn squash makes the perfect bowl and requires little prep work which I love!